Jingle Bells, Jingle Bells, jingle all the way, what a time of year to see Davey Asprey play… hey!!! Sooo the reindeer is out of the bag and this Christmas we mark the 5th edition of the UKTS Christmas shindig with a very special guest, Mr Davey Asprey!!! Why is Davey playing at our Christmas party? Well this Christmas it’s all for a good cause! We’re all lucky to have an incredible group of people around us, but what about those that haven’t? This year we wanted to do something a bit different and raise awareness and money for a charity which combats loneliness and isolation called South London Cares. We will be fundraising in two ways. We will be holding a raffle and have secured some amazing prizes generously donated from the trance community. We will also be taking donations at the door, with all proceeds from both going direct to South London cares. When Davey heard what were looking to do he kindly volunteered his time and offered to play for us in order to help us raise as much money as we can! An offer we were delighted to accept! Supporting Davey will be some of the usual misfits as well as some new DJ’s, who are all active members of UKTS. 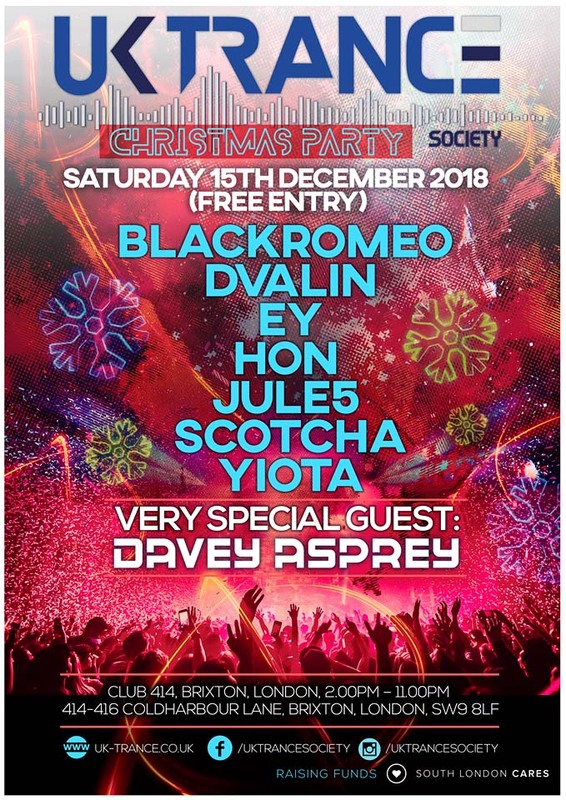 Blackromeo is making his return after a brilliant year of mixes, Yiota is making a UKTS return after a fantastic set at Aurora, Ey making her London debut and Jule5, Dvalin, Hon and Scotcha all returning for what is going to be an incredible Christmas bash! More details will be announced nearer the time. We can’t wait for you to join us on the 15th!